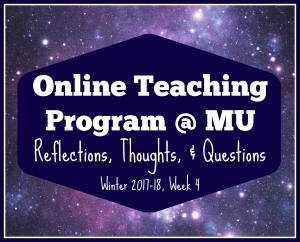 For the past year, I’ve been on a journey of lifelong learning as I complete the Online Teaching program at Millersville University. I’m incredibly grateful for the opportunity I’ve had to take a sabbatical, too, because it allowed me to extend my maternity leave and spend more time with my daughter. As this time comes to an end, though, it’s bittersweet. I’ve always loved being a student, and I thrive in academic culture, so this has been a wonderful experience professionally, not to mention a much-needed and welcome change of pace. I feel recharged and full of new, innovative ideas backed by the latest educational research. I can’t wait to start implementing them and making our library program better for my students. Still, I’m going back to work with mixed feelings, like I imagine most working mamas do. I love my job, but my daughter now takes priority over it. I’m pretty sure it will be a constant push-and-pull on my heartstrings now as I attempt to balance all the “things” I have to do and want to do. So as a culminating assignment in my last course, ACTE 632 Online Learning Environments, I’m reflecting on how my learning meets the iNACOL National Standards for Quality Online Teaching. Below is a list of each standard with links to my assignments, presentations, and reflections on meeting each standard. Standard A – The online teacher knows the primary concepts and structures of effective online instruction and is able to create learning experiences to enable student success. Standard B – The online teacher understands and is able to use a range of technologies, both existing and emerging, that effectively support student learning and engagement in the online environment. Since entering this program, I have learned to use and incorporate SeeSaw, Padlet, NoteBookCast, and Google Classroom. Moreover, I’ve become an advanced “power” user of Google Drive & Forms, YouTube & its editing features, Screencast-O-Matic, and the accessibility features of PDF software. I consider myself very tech-savvy, and I use a lot of tech tools in my instruction as is. However, when I first started the program, I hated doing videos and screencasts because I’m a perfectionist, and editing is very time-consuming. As a result, I avoided doing media work if I could help it. This program has absolutely challenged me to let go a bit and just create media that’s “good enough” to share what I’ve learned and then move on. Every single class required some video work, and that’s pushed me to be a more engaging educator too. Standard C – The online teacher plans, designs, and incorporates strategies to encourage active learning, application, interaction, participation, and collaboration in the online environment. In ACTE 630: Current Technology in Online Education, I tried out Collaborate Ultra in a synchronous learning session with my dad and my husband as my “students.” While most of my online class development and work since has been completely asynchronous, that experience showed me how effective an “in-class” chat session online can be for students and teachers. 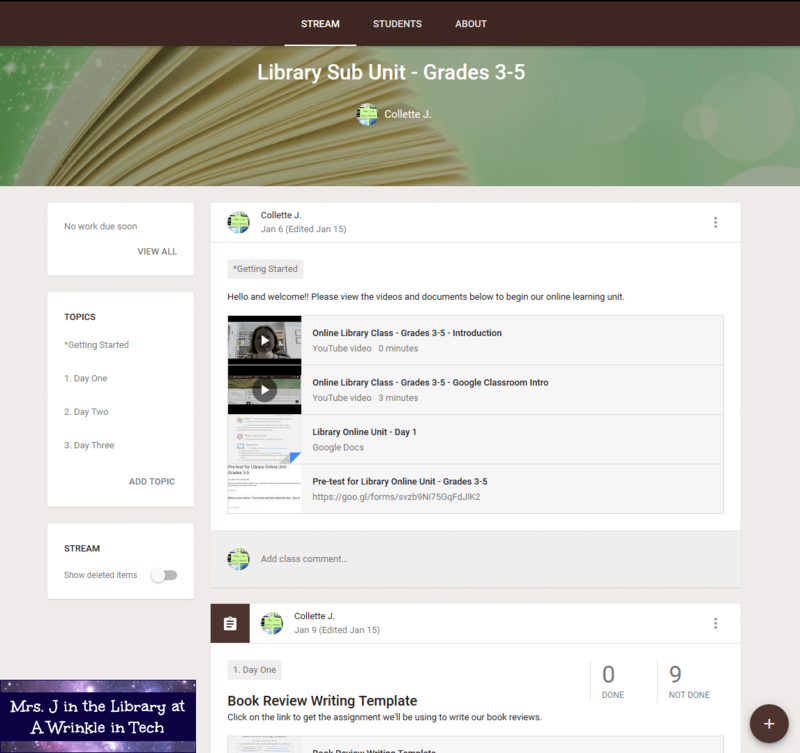 One of the ways I’ve applied a more blended approach to my student-centered instruction is to convert some of the library centers (used in 3rd, 4th, and 5th grades) to Google Forms and Docs. I plan to move more of them to the Google format so that I’m using less paper and students won’t ever lose their papers with their work on them. Standard D – The online teacher promotes student success through clear expectations, prompt responses, and regular feedback. In addition, I created feedback stickers (printable coming soon!) for paper assignments that print on regular address labels. 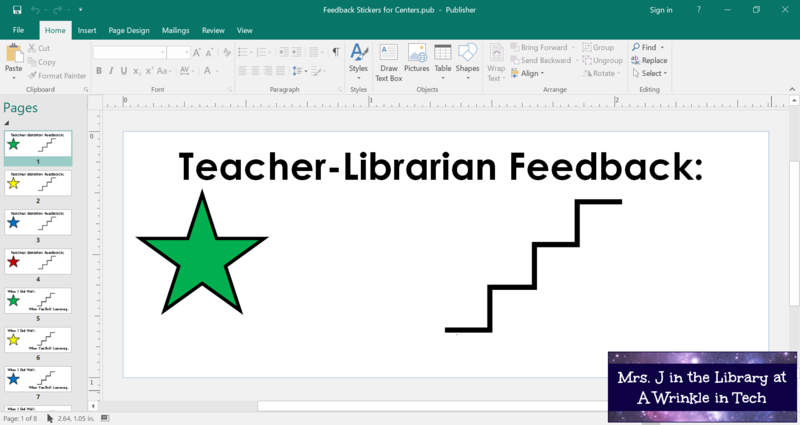 I can write my feedback on them in the Stars and Stairs format, then stick it on a students’ assignment as I’m circulating the room helping students and answering questions. Standard E – The online teacher models, guides, and encourages legal, ethical, and safe behavior related to technology use. Teaching digital citizenship is integrated into both the Social Skills and Discovery “specials” at our school, however, I model and teach students not to plagiarize, how to cite their sources with bibliographic citations, and evaluate information they find online. For example, I model digital citizenship by linking to the the image source for almost every image on the library website. In my review of Biblionasium in ACTE 634: Legal and Ethical Issues in Online Education, I examined how the site measured up to FERPA and COPPA legislation designed to protect student privacy. Standard F – The online teacher is cognizant of the diversity of student academic needs and incorporates accommodations into the online environment. Throughout the Online Teaching program, I learned about Universal Design for Learning, and how it benefits not only students with special learning needs, but everyone in the class. As a result, when I built my online unit in Google Classroom, I added screencast videos of myself reading the directions and assignments aloud. These videos are linked in each Google Doc and Google Form that is in my unit (see examples below). I also added appropriate images when possible to help visual learners understand the content as well. I still have some areas and content that could be more accessible in my online unit, but overall, I’m happy with my progress and how I integrated the UDL features into my content. My research on dyslexia in ACTE 633: Responding to Individual Learners led me to create a dyslexia-friendly reading template for teachers to make articles and online text easier to read for students with dyslexia. Standard G – The online teacher demonstrates competencies in creating and implementing assessments in online learning environments in ways that ensure validity and reliability of the instruments and procedures. Standard H – The online teacher develops and delivers assessments, projects, and assignments that meet standards-based learning goals and assesses learning progress by measuring student achievement of the learning goals. In the Library Sub Unit I created in Google Classroom, I used assessment checklists for students to both self-assess and peer-assess their book reviews. Standard I – The online teacher demonstrates competency in using data from assessments and other data sources to modify content and to guide student learning. In my Library Sub Unit, I used information from the student book choices to organize students into small groups by fiction genre or nonfiction topic. My hope is that these small group discussions will be more engaging to students and less overwhelming. Standard J – The online teacher interacts in a professional, effective manner with colleagues, parents, and other members of the community to support students’ success. I have a robust professional learning network (PLN) through this blog, Facebook groups, and Twitter, where I interact with other teacher-librarians and educators to learn and share new tech tools and best practices. Besides using SeeSaw to communicate with parents individually (a goal of mine for next school year), I have a library Facebook page and Twitter to engage parents and community members. Standard K – The online teacher arranges media and content to help students and teachers transfer knowledge most effectively in the online environment. This is one area that I think I had a head-start on, as I’m already a very organized person and I’m adept at creating documents with media and graphics for my lessons. I’d eventually like to move as much of my instruction as makes sense to a blended environment. Obviously most of the makerspace centers can and should remain a hands-on real-life experience, but many of the research and reading centers’ documentation can move online with a (large) time investment. As a library department co-chair, I’m also looking forward to sharing what I’ve learned with the other teacher-librarians in my district, and getting in touch with our district’s in-house virtual academy. I think our school libraries can play a larger role in those students’ education, perhaps by doing more outreach to them and finding out what their needs are. Personally and professionally, I figured out early in the Online Teaching program that teaching 100% online wasn’t for me, even if online schools were hiring teacher-librarians (worryingly they aren’t). However, I’ve gained new skills and a new appreciation for just how quickly the education landscape is changing. If we as teacher-librarians hope to stay relevant, we absolutely *must* be an embedded part of online and digital learning in our schools and districts. For more information about how to do that, I highly recommend Brenda Boyer’s article, “Designer Librarian” in the May/June 2015 issue of TechTrends. It’s available in the Academic OneFile database in EBSCO, so check if any of your local libraries subscribe.